SANSON -Mappe-Monde Geo-Hydrographique, ou Description Generale..
SANSON, [Guillaume]/ JAILLOT,H. 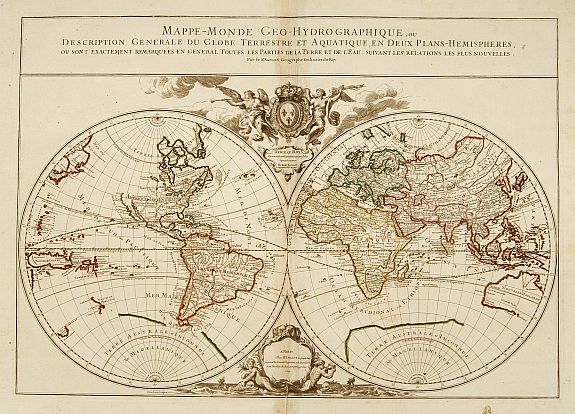 - Mappe-Monde Geo-Hydrographique, ou Description Generale..
Mappe-Monde Geo-Hydrographique, ou Description Generale.. - SANSON, [Guillaume]/ JAILLOT,H. Map maker : SANSON, [Guillaume]/ JAILLOT,H.. Size : 18.3 x 25.8 inches. / 46.5 x 65.5 cm. Description :"MAP OF THE WORLD DEDICATED TO LOUIS XIV. Large map of the world in two hemispheres, in a stereographic projection (each hemisphere 31.5 cm in diameter). California seems to be connected to the mainland, rather than appearing as an island, but the placement of the lettering slightly obscures the connection. The map in its first state, dated ,169, and dedicated to King Louis XIV, appears in (Antoine-)Hubert Jaillot's 1695 Atlas François. It was engraved by (Louis) Cordier. Shirley mentions states of the plate dated 1700 and 1706, but gives no locations; and Pastoreau still records the ,169, state in a copy of the 1700 edition of Jaillot's atlas. With title in a panel across the head, imprint in a decorative cartouche with mermaids and dolphins at the foot, and dedication to the (by this time deceased) King Louis XIV in a cartouche above, under the royal arms supported by 2 angels, 1 with a trumpet. Jaillot and his heirs continued to publish his atlas with the 1700 date on the title-page for many years, and Pastoreau records copies with the ,Mappe-Monde, printed from the plate in the 1706 and the present 1719 states. The original dedication to Louis XIV had conveniently said simply ,Dedié au Roy,, so after he died in 1715, leaving the government in the hands of the regents until Louis XV came of age in 1723, the revisors of the map let the dedication to the unnamed king stand. The plate was apparently not revised again after 1719, but Jaillot's heirs continued to use it so that the map appears in their atlases for twenty years into the reign of Louis XV. The literature records no copies of Jaillot's atlas later than 1738, but that date is based on the engraved date in one of the maps, so some copies recorded under that date may be somewhat later. The present copy of the ,Mappe-Monde, is watermarked ,J (or I) [pillar topped by ,T,] DUPVY MOYEN|AUVERGNE 1742, = chaplet (cf. Heawood 238), and was formally bound with other maps from Jaillot's atlas with similar 1742 Dupuy watermarks, as well as other maps (with different watermarks) probably issued by Gilles Robert in the years 1742-1745. From 1731 Jaillot's firm was in the hands of his grandson Bernard-Antoine (d. 1749). Still a good copy of an attractively decorated map of the world. Reference: Cat. Nat. Mar. Mus. III, 240, map 70; Pastoureau, Jaillot II C-D, G & I map 1 (cf. map 1 in II A, E & F); Phillips & LeGear 534, map 1; this state not mentioned in Shirley (cf. 569); Lexikon Gesch. Kartographie, pp. 353-354 & 699-701." Condition : Folded down the middle, with traces of a stub on the reverse from binding in a folio composite atlas. Minor spotting in the generous margins, and a neatly repaired tear along the fold, slightly affecting the cartouche at the foot.